Have you ever wondered what would happen if there were a planetary electrical outage? If every grid just ... failed. And stayed out for a few days or weeks. What would be the ramifications? No gas pumps would work, refrigeration would end, ventilators would stop, and -- worst of all -- the power needed to maintain cooling ponds for spent nuclear fuel rods would be lost. 400 generators in the US alone would fail, with results that would dwarf Fukushima. Considering how many thousands of nuclear facilities exist around the world, most of them dependent on electricity to maintain their safety and cooling systems, you can imagine the possibly extinction-level catastrophe that would follow a global power outage. Can't happen? Such an event did happen, as recently as 1859, and it knocked out what electrical systems existed in the pre-nuclear age. It was a solar flare, and they are not uncommon, occurring every hundred years or so. The good news is there is an inexpensive fix that could prevent a massive radiation leak that would follow the failure of the cooling systems. The bad news is Congress won't appropriate the money to install the system. "Well-known physicist Michio Kaku and other members of the American Physical Society asked Congress to appropriate $100 million to harden the country's electrical grid against solar flares. As shown below, such an event is actually the most likely Armageddon-type event faced by humanity. "Kaku explains that a solar flare like the one that hit the U.S. in 1859 would -- in the current era of nuclear power and electric refrigeration -- cause widespread destruction and chaos. Not only could such a flare bring on hundreds of Fukushima-type accidents, but it could well cause food riots globally. "Kaku explains that relief came in for people hit by disasters like Katrina or Sandy from the 'outside.' But a large solar flare could knock out a lot of the power nationwide. So -- as people's food spoils due to lack of refrigeration -- emergency workers from other areas would be too preoccupied with their own local crisis to help. There would, in short, be no 'cavalry' to the rescue in much of the country. In fact, NASA scientists are predicting that a solar storm will knock out most of the electrical power grid in many countries worldwide, perhaps for months." 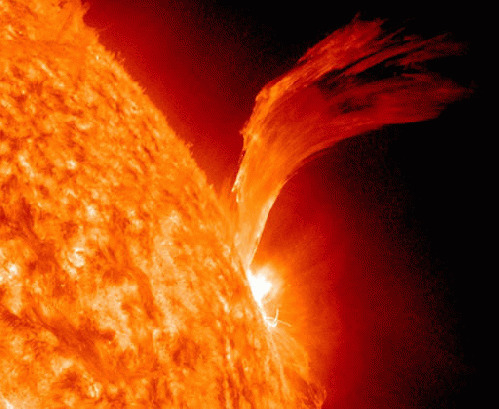 "Earth barely missed the 'perfect solar storm' that could have smashed into our magnetic field and wreaked havoc with our satellite systems, electronics and power systems, potentially causing trillions of dollars in damage, according to data from NASA's STEREO-A spacecraft. If the solar onslaught had occurred just nine days earlier, it would have rivaled the 1859 Carrington event... 'Observations of such a solar superstorm during a very weak solar cycle indicate that extreme events are not as infrequent as we imagine,' the authors wrote." "The Congressionally mandated EMP (electromagnetic pulse) Commission has studied the threat of both EMP [i.e. an electromagnetic pulse set of by terrorists or adversaries in war] and extreme GMD events and made recommendations to the US Congress to implement protective devices and procedures to ensure the survival of the grid and other critical infrastructures in either event. John Kappenman, author of the Metatech study, estimates that it would cost about $1 billion to build special protective devices into the US grid to protect its EHV transformers from EMP or extreme GMD damage and to build stores of critical replacement parts should some of these items be damaged or destroyed. Kappenman estimates that it would cost significantly less than $1 billion to store at least a year's worth of diesel fuel for backup generators at each US nuclear facility and to store sets of critical spare parts, such as backup generators, inside EMP-hardened steel containers to be available for quick change-out in the event that any of these items were damaged by an EMP or GMD. "For the cost of a single B-2 bomber or a tiny fraction of the Troubled Asset Relief Program (TARP) bank bailout, we could invest in preventative measures to avert what might well become the end of life as we know it. There is no way to protect against all possible effects from an extreme GMD or an EMP attack, but we could implement measures to protect against the worst effects. Since 2008, Congress has narrowly failed to pass legislation that would implement at least some of the EMP Commission's recommendations." This is one infrastructure repair our government shouldn't ignore. But they're busy with the coming midterms and all. Oh, and repealing the Affordable Care Act. And starting new Benghazi hearings.